Designed by Ole Aanderud Larsen, Endurance was built at the Framnæs shipyard in Sandefjord, Norway and fully completed on 17 December 1912. She was built under the supervision of master wood shipbuilder Christian Jacobsen, who was renowned for insisting that all men in his employment were not just skilled shipwrights but also be experienced in seafaring aboard whaling or sealing ships. Every detail of her construction had been scrupulously planned to ensure maximum durability: for example, every joint and fitting was cross-braced for maximum strength. The ship was launched on 17 December 1912 and was initially christened Polaris (eponymous with Polaris, the North Star). She was 144 feet (44 m) long, with a 25 feet (7.6 m) beam and measured 348 tons gross. Her original purpose was as an ice-capable steam yacht, to provide luxurious accommodation for small tourist and hunting parties in the Arctic. As launched she had 10 passenger cabins, a spacious dining saloon and galley (with accommodation for two cooks), a smoking room, a darkroom to allow passengers to develop photographs, electric lighting and even a small bathroom. Though her hull looked from the outside like that of any other vessel of a comparable size, it was not. She was designed for polar conditions with a very sturdy construction. Her keel members were four pieces of solid oak, one above the other, adding up to a thickness of 85 inches (2,200 mm), while its sides were between 30 inches (760 mm) and 18 inches (460 mm) thick, with twice as many frames as normal and the frames being of double thickness. She was built of planks of oak and Norwegian fir up to 30 inches (760 mm) thick, sheathed in greenheart, a notably strong and heavy wood. The bow, which would meet the ice head-on, had been given special attention. Each timber had been made from a single oak tree chosen for its shape so that its natural shape followed the curve of the ship's design. When put together, these pieces had a thickness of 52 inches (1,300 mm). Of her three masts, the forward one was square-rigged, while the after two carried fore and aft sails, like a schooner. As well as sails, Endurance had a 350 horsepower (260 kW) coal-fired steam engine capable of speeds up to 10.2 knots (18.9 km/h; 11.7 mph). By the time of launch on 17 December 1912, Endurance was perhaps the strongest wooden ship ever built, with the possible exception of Fram, the vessel used by Fridtjof Nansen and later by Roald Amundsen. However, there was one major difference between the ships. Fram was bowl-bottomed, which meant that if the ice closed in against her it would be squeezed up and out and not be subject to the pressure of the ice compressing around her. By contrast Endurance was designed with great inherent strength in her hull to resist collision with ice floes and to break through pack ice by ramming and crushing. However she was not intended to be frozen into heavy pack ice, and so was not designed to rise out of a crush. In such a situation she was dependent on the ultimate strength of her hull alone. As Endurance was built for Adrien de Gerlache and Lars Christensen, they intended to use her for polar cruises for tourists to hunt polar bears. Financial problems led to de Gerlache pulling out of their partnership, leaving Christensen unable to pay the Framnaes yard the final amounts to hand over and fit out the ship. For over a year Christensen attempted to sell the ship as her unique design as an ice-capable passenger-carrying ship, with relatively little space for stores and no cargo hold made her useless to the whaling industry. Meanwhile she was too big, slow and uncomfortable to be a private steam yacht. In the event Christensen was happy to sell the ship to Ernest Shackleton for GB£11,600, which represented a significant loss to him as it barely covered the outstanding payments to Framnaes, let alone the ship's total build costs. He is reported to have said he was happy to take the loss in order to further the plans of an explorer of Shackleton's stature . After Shackleton purchased the ship, she was rechristened "Endurance" after the Shackleton family motto "Fortitudine vincimus" (By endurance we conquer). Shackleton had the ship relocated from Norway to London. She arrived at the Millwall Dock in the spring of 1914 where she was refitted and modified for expedition purposes. She was stripped of most of her luxurious accommodation and fittings. This included removing many of the passenger cabins to make room for space for stores and equipment, while the crew cabins on the lower deck were removed and converted into a cargo hold - the reduced crew of sailors that Shackleton would take on the expedition would make their quarters in the cramped forecastle. The darkroom remained in its original location ahead of the boiler. The refit also saw the ship repainted from her original white paint to a more austere (and visible amongst ice) black, and features such as gilt scrollwork on the bow and stern, were painted over. Despite her change of name she retained a large badge in the shape of a five-pointed star on her stern, which originally symbolized her name after the pole star. Her new equipment included four ship's boats. Two were 21-foot (6.4 meter) transom-built rowing cutters purchased secondhand from the whaling industry. The third was a larger 22.5-foot (6.85 meter) double-ended rowing whaleboat built for the expedition to specifications drawn up by Frank Worsley, Endurance's new captain. The fourth was a smaller motorboat. After her refit she made the short coastal journey to Plymouth. In the previous 16 years, nearly two dozen wooden vessels had sailed to the icy seas of the far south. All had returned home but the Aurora. Lloyd's of London and the Indemnity Marine Assurance Company had underwritten her hull, machinery and equipment for £15,000. Just before she sailed, The Times had reported that "Hitherto the insurance of vessels taking part in Antarctic exploration has ceased at the last port touched, and Endurance will be the first vessel to be insured in the ice zone." The Times had praised Endurance as "built specially for work in Polar seas," adding that "in an ice-coated sea there can be no turbulent waves which are the causes of so many disasters in warmer zones." Endurance sailed from Plymouth, England on 6 August 1914 and set course for Buenos Aires, Argentina. Shackleton remained in Britain, finalising the expedition's organization and for some last-minute fundraising. This was Endurance's first major voyage following its completion and amounted to a shakedown voyage. The trip across the Atlantic took more than two months. Built for the ice, her hull was considered by many of her crew too rounded for the open ocean. Shackleton took a steamer to Buenos Aires and caught up with his expedition a few days after Endurance's arrival. On October 26, 1914 Endurance sailed from Buenos Aires to what would be her last port of call, the whaling station at Grytviken on the island of South Georgia, arriving on November 5. She left Grytviken on 5 December 1914 heading for the southern regions of the Weddell Sea. Two days after leaving from South Georgia, Endurance encountered polar pack ice and progress slowed down. For weeks Endurance worked its way through the pack, averaging less than 30 miles (48 km) per day. By 15 January 1915 Endurance was within 200 miles (320 km) of her destination, Vahsel Bay. However, by the following day, heavy pack ice was sighted in the morning and in the afternoon a gale developed. Under these conditions it was soon evident progress could not be made, and Endurance took shelter under the lee of a large grounded berg. During the next two days, Endurance moved back and forth under the sheltering protection of the berg. On 18 January the gale began to moderate and Endurance set the topsail with the engine at slow. The pack had blown away. Progress was made slowly until hours later Endurance encountered the pack once more. It was decided to move forward and work through the pack, and at 5:00 pm Endurance entered it. However, it was noticed that this ice was different from what had been encountered before. The ship was soon amongst thick but soft brash ice. The ship became beset. The gale now increased in intensity and kept blowing for another six days from a northerly direction towards land. By 24 January, the wind had completely compressed the ice in the whole Weddell Sea against the land. Endurance was icebound. All that could be done was to wait for a southerly gale that would start pushing, decompressing and opening the ice in the other direction. Instead, the days passed and the pack remained unchanged. Endurance drifted for months beset in the ice in the Weddell Sea. The changing conditions of the Antarctic spring brought such pressure that broke the hull of Endurance over the period from 27 October 1915, causing flooding of interior spaces. On the morning of 21 November 1915, Endurance's superstructure began to break and her timbers began snapping and thus she had to be abandoned. The crew remained on the ice for several more weeks, and when the ice pack broke up they used Endurance's three lifeboats to reach Elephant Island. 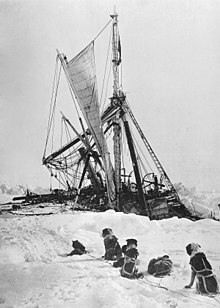 Twenty-two men waited while Shackleton and five others took the largest of the lifeboats, James Caird, and sailed to South Georgia to obtain rescue for the rest of the crew. Shackleton arrived at the whaling station on South Georgia Island two weeks later, but because the whaling ships were not equipped to penetrate Antarctic sea ice it took Shackleton three months before he successfully approached Elephant Island in August 1916 and rescued the rest of his crew on his third attempted rescue mission. Bakewell. American, may have claimed to be Canadian when he applied to join the Imperial expedition in Buenos Aires. Blackborrow was originally refused a post aboard the vessel due to his young age and inexperience and decided to stow away, helped to sneak aboard by William Bakewell, a friend of his, and Walter How. When he was found Shackleton decided to make him a steward rather than leave him ashore at South Georgia. Blackborrow eventually proved his worth, earning the Bronze Polar Medal, and the honour of becoming the first human being ever to set foot on Elephant Island. His name is also the matter of some debate—it is sometimes spelled Percy, or Blackboro, or in other ways. Alfred Lansing wrote a book titled Endurance: Shackleton's Incredible Voyage about the ordeal that Shackleton and his men endured aboard the ship. It became a bestseller when first published in 1959. Two Antarctic patrol ships of the British Royal Navy have been named Endurance in honour of Shackleton's ship. The first HMS Endurance, launched in May 1956 and awarded pennant number A171 sometime later, acted as an ice patrol and hydrographic survey ship until 1986. The second HMS Endurance was bought from Norway in 1992 where she was named MV Polar Circle. She suffered severe flooding in 2008 due to procedural errors during maintenance and despite being returned to the UK was not repaired prior to being scrapped in 2016. On 8 February 2017, an episode of the preeminent Australian fact-based comedy podcast Do Go On was released wherein the details of Endurance's final voyage were discussed at great length. The discussion was helmed by David J. Warneke with Jess "Bop" Perkins and Matt Stewart also in attendance. In 1998, wreckage found at Stinker Point on the south western side of Elephant Island was incorrectly identified as flotsam from the ship. However, it belonged to the 1877 wreck of the Connecticut sealing ship Charles Shearer. In 2001, wreck hunter David Mearns unsuccessfully planned an expedition to find the wreck of Endurance. By 2003, two rival groups were making plans for an expedition to find the wreck; however no expedition was actually mounted. In 2010, Mearns announced a new plan to search for the wreck. The plan is sponsored by the National Geographic Society but is subject to finding sponsorship for the balance of the US$10 million estimated cost. A 2013 study by Dr Adrian Glover of the Natural History Museum, London suggests the Antarctic Circumpolar Current could preserve the wreck on the seabed by keeping wood-boring "ship worms" away. A Weddell Sea Expedition to locate and possibly photograph the wreck using long-range Autonomous Underwater Vehicles was underway in the Antarctic summer of 2018–19. ^ Heacox, Kim (1999). The Antarctic Challenge. Washington, D.C.: National Geographic. p. 82. ISBN 978-0792275367. ^ "Ernest Shackleton, Endurance Voyage, Time Line and Map". CoolAntarctica.com. 2001. Retrieved 2012-10-27. ^ "Shackleton's Ad – Men Wanted for Hazardous Journey". Discerning History. 2013-05-05. Retrieved 2018-12-26. ^ "The Greatest Adventures of All Time — The Great Survivor". TIME. 2003-09-12. Retrieved 2011-03-27. ^ Elmore, Carl Hopkins (1944-01-01). Quit You like Men. New York: Charles Scribner’s Sons. p. 53. OCLC 903946983. ^ "Shackleton Probably Never Took Out an Ad Seeking Men for a Hazardous Journey". Smithsonian.com. 2013-09-10. Retrieved 2018-12-26. ^ a b "Endurance Rush". OutsideOnline.com. 1915-11-21. Archived from the original on 2010-09-20. Retrieved 2011-03-27. ^ "Endurance, Ships of the Antarctic explorers". Coolantarctica.com. Retrieved 2011-03-27. ^ "Shackleton's ship 'ultimate challenge'". Sydney Morning Herald. January 16, 2010. Retrieved 2011-03-27. ^ "Blue Water Recoveries are a deep sea shipwreck recovery company". Bluewater.uk.com. Retrieved 2011-03-27. ^ Jonathan Amos (14 August 2013). "Antarctic: Where 'zombies' thrive and shipwrecks are preserved". =BBC News. Retrieved 14 August 2013. ^ "Weddell Sea Expedition". Retrieved 27 January 2019. Shackleton, Ernest (1982) . South: The story of Shackleton's 1914–17 expedition . London: Century Publishing. ISBN 0-7126-0111-2. Wikimedia Commons has media related to Endurance (ship, 1912). Website of the Royal Geographic Society Holders a large collection of pictures of Endurance. This page was last edited on 1 April 2019, at 11:46 (UTC).